Steven (Chicagoland, United States) on 7 July 2014 in Plant & Nature and Portfolio. Jack-in-the-pulpit is an intriguing wildflower native to eastern and midwestern North America, but is easily grown in shade gardens elsewhere. It gets its common name from its odd flower: a pouch-shaped spathe ("pulpit") with an overhanging hood that surrounds a fingerlike central spadix ("jack"). Jack-in-the-pulpit produces one to two 3-lobed leaves 12 to 18 inches high. 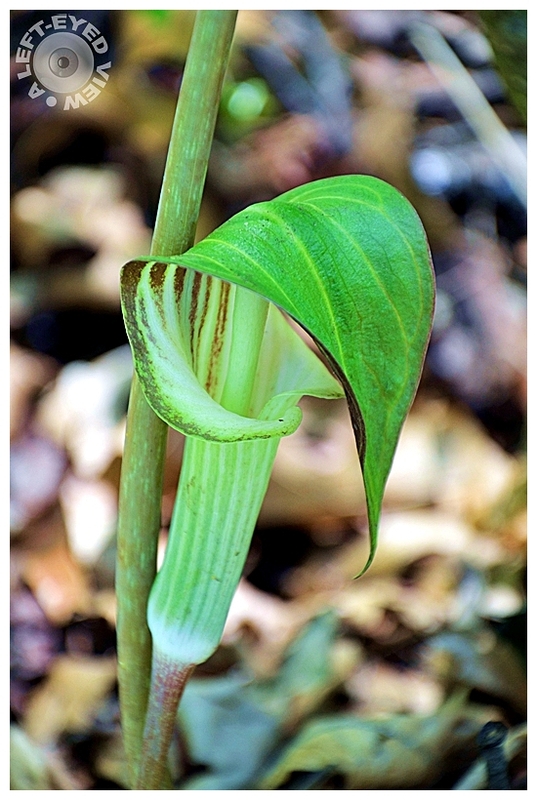 The leaves appear in early spring as does the flower, which is composed of a green-and-purple striped spathe bent over at its tip to partly hide the green clublike spadix. After the flower fades, a cluster of bright red berries appears and lasts for much of the summer. The leaves fade away in midsummer if the plant is not watered regularly but grow back in spring from an underground tuber. Tomorrow a photo with the Jack-in-the-pulpit's "overhanging hood" will be posted revealing its eye-catching underside and the spadix ("jack"). Photo captured May 29, 2014. Certainly, is an intriguing flower. @tataray: En effet! La photo de demain ressemblera plus à un arum. Interesting plant with an interesting name. such beautiful compositin, focus, colors, lighting & bokeh! A beautifully focused image of the flower. It's a marvelous green. One of my favorite flowers! This is a lovely image and a great close up! Beautiful color and detail! Quelle plante quelle forme et iamge sueprbe. I love these ... haven't seen any in years!